Updated 5-14-15! Read the after action report here. 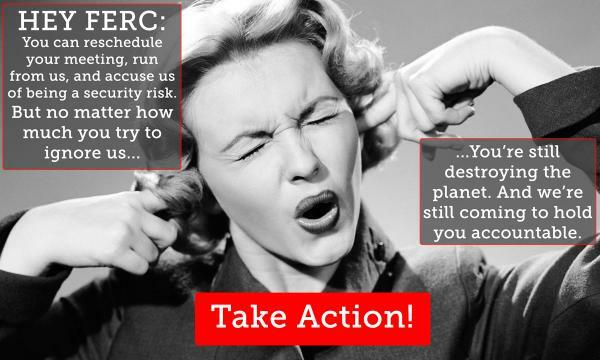 FERC announced May 7th that it will be changing the date of its May commissioners meeting from May 21st to May 14th because of mass nonviolent protests Beyond Extreme Energy is coordinating at FERC May 21-29. TAKE ACTION NOW: Join us May 14th! Sorry, FERC. We’re still going to pay you a visit May 21-29. But we’re sure to be there May 14th, too. Why? That’s easy! Lusby, MD. Cove Point. Myersville. Minisink, NY. Roseland, NJ. Jordan Cove, OR. Seneca Lake, NY. Adams and Middlesex, PA. Easton and Milford, PA. Leesburg, VA. Pinelands, NJ. Burrilville, RI. West Roxbury, MA. And many more. Albany County, GA. Berkshire, Hampshire, Franklin, Worcester, Middlesex, Essex, and Norfolk Counties in MA. Cheshire, Hillsborough, and Rockingham Counties in NH. Madison, Chemung, and Montgomery Counties in NY. Nelson, Augusta, Buckingham, and Loudon Counties in VA. More counties in PA than can be listed here. And many, many more. It’s because of these communities and hundreds more just like them around the country that you, FERC, sell out daily to the gas industry. It’s because new gas infrastructure wastes resources, guarantees climate disruption, and is not in the national interest. It’s because your personnel, your priorities, and your process are so obviously rigged against us and in favor of gas and oil companies’ profits. FERC, you should write this down. We are not going away. 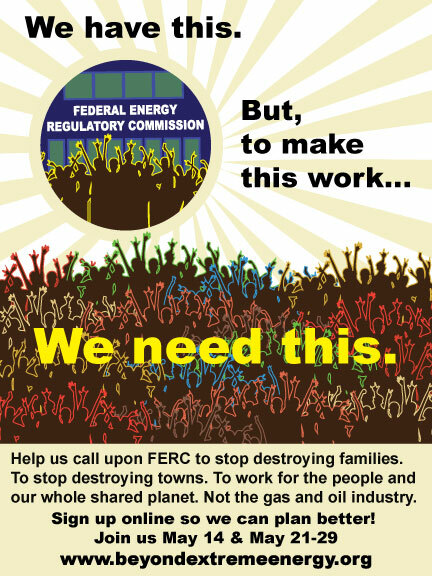 Join the Beyond Extreme Energy coalition May 14th in bringing the citizens’ voice to FERC’s next commissioners meeting. The Commission is uncomfortable with the new level of scrutiny it has received in the last six months. We need YOU there to help them understand that a new day has dawned in which their anti-community/anti-climate decisions are going to be fought tirelessly and vigorously. We are in this together. Our neighbors’ fights are our own. NO HOME IS A SACRIFICE ZONE! Let us know you’re coming so that we can plan more effectively. We’ll be in touch soon! Click here to sign up for May 14th. Energy is coming to the Federal Energy Regulatory Commission, but it’s not the kind they’re accustomed to. Join us for one day or many during May 21-29 and help BXE and its allies build this movement for community control and climate sanity. Click here to register for Stop The #FERCus.